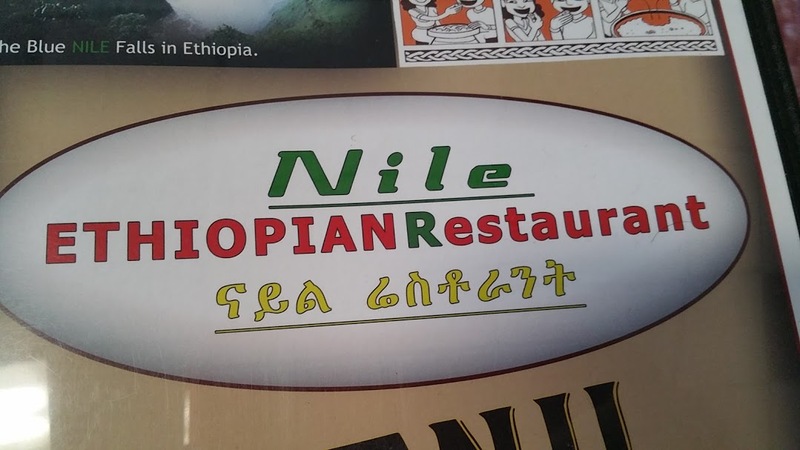 This was my second visit to the Nile Ethiopian Restaurant, it has been almost a year, and once I entered, I wondered why I had stay away so long. Small tidy enterior, with wall hangings unique to the culture. A family business, run by some of the nicest people I have ever met. It just feels right. Some of the party had eaten here before, others have no previous experience, with this particular cuisine, or eating with out utensils. 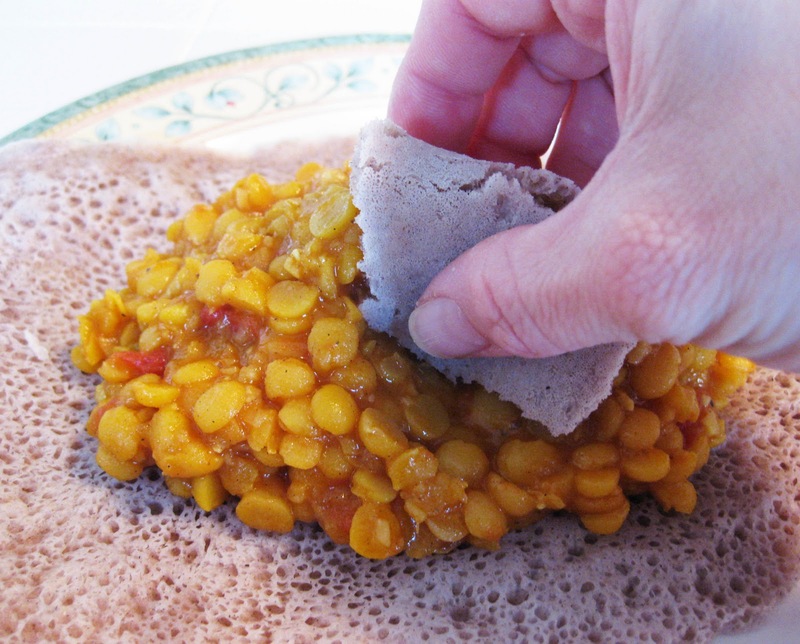 Don’t think there are no utensils, they do have them , but the food is meant to be eaten by hand. 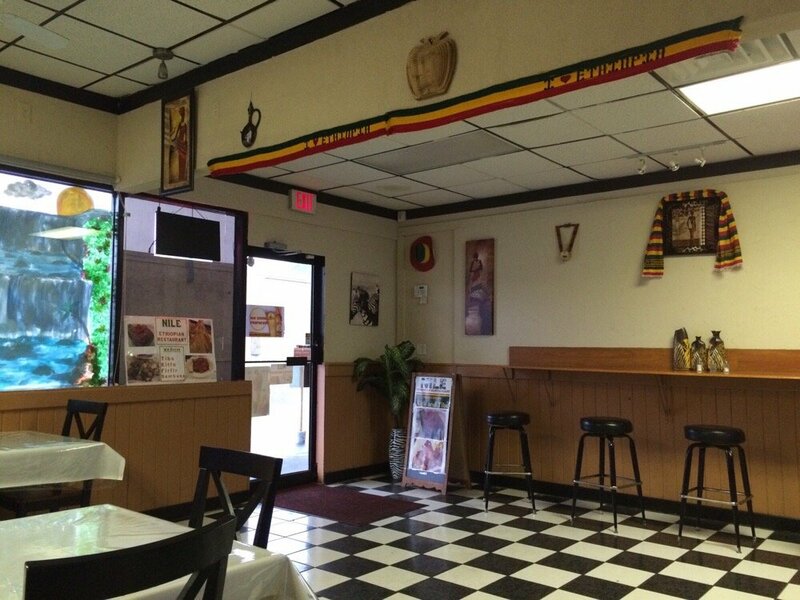 The owner, who waited on us was very informative in explaining the menu to the novices and we were ready to go. 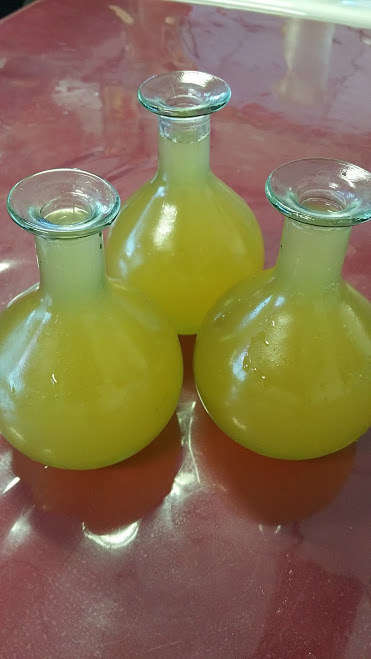 I suggested the group try the house made Honey Wine, this is a mild brew lthat leaves a distinct taste honey on the back of the throat. 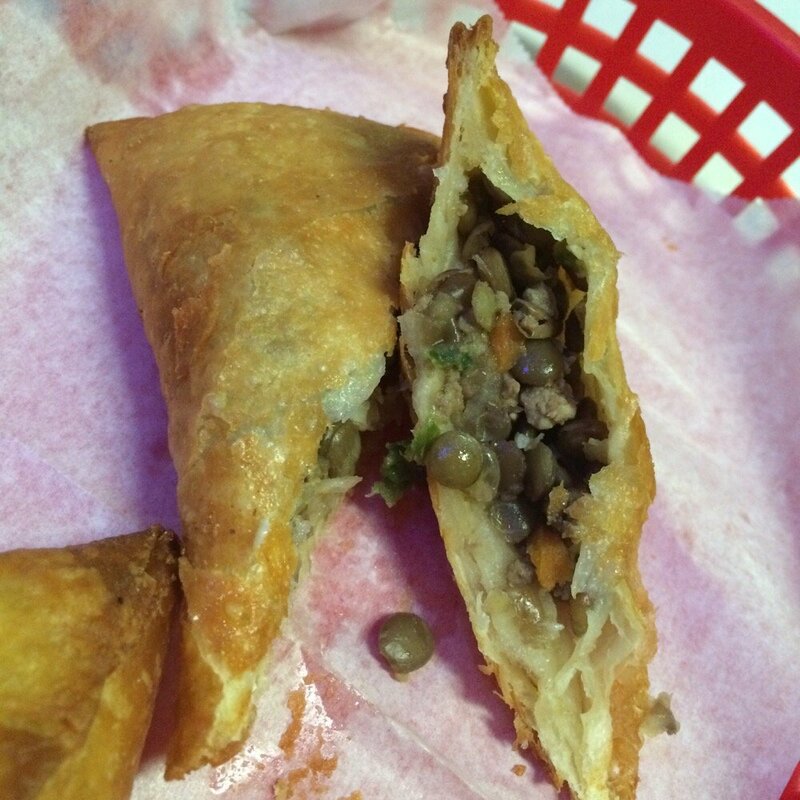 We started with the Vegetable Sambusa, a pastry shell filled with lentils, onions, green peppers and herbs. These were perfectly cooked and flavorful on the inside. 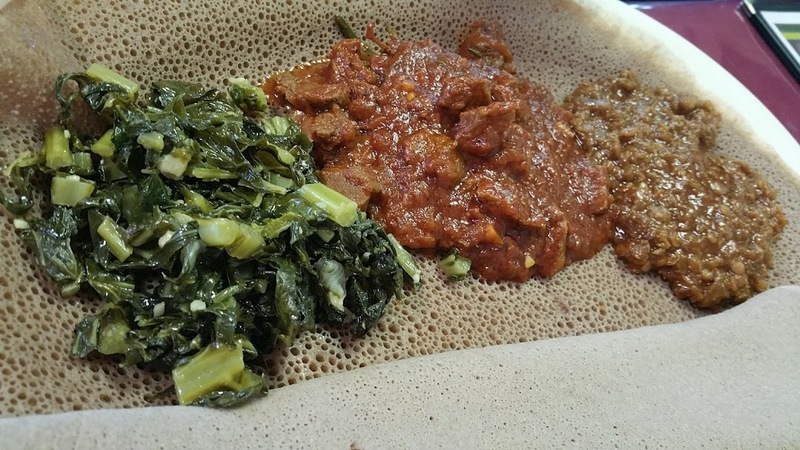 For those not familiar with Ethiopian food, it is served on a tray, containing a large pancake, or Injera , a traditional Ethiopian bread, not only a kind of bread—it’s also an eating utensil. 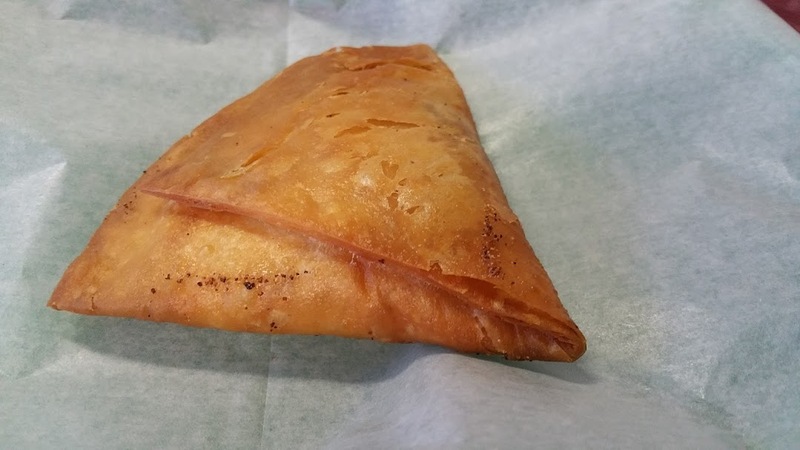 This may be foreign to our taste buds many do not like it, I personally find it amazingly beautiful and the child in me rejoices in eating with my fingers. 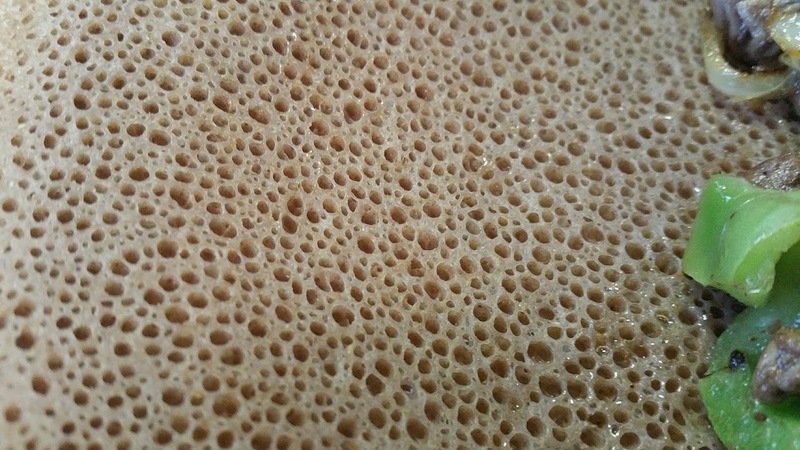 The last time I was here the Injera was made with yellow teff , a fine grain—about the size of a poppy seed—that comes in a variety of colors, from white and red to dark brown, today’s teff was red and far superior. So now we know what and how, let’s see the choices out group decided on. 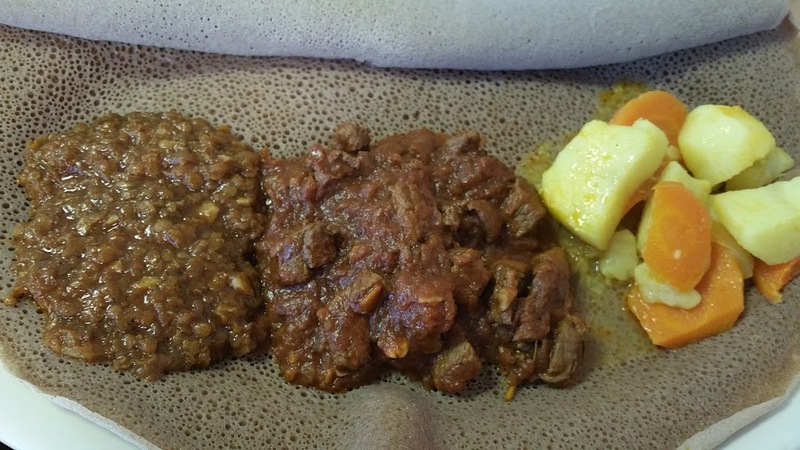 Meat spicy and tender stewed in a fine tomato sauce, green lentils cooked al dente, and potato and carrot vegetables firm but well cooked. Another tasty dish, excellently executed. Collards sweet and tender, beef tender. 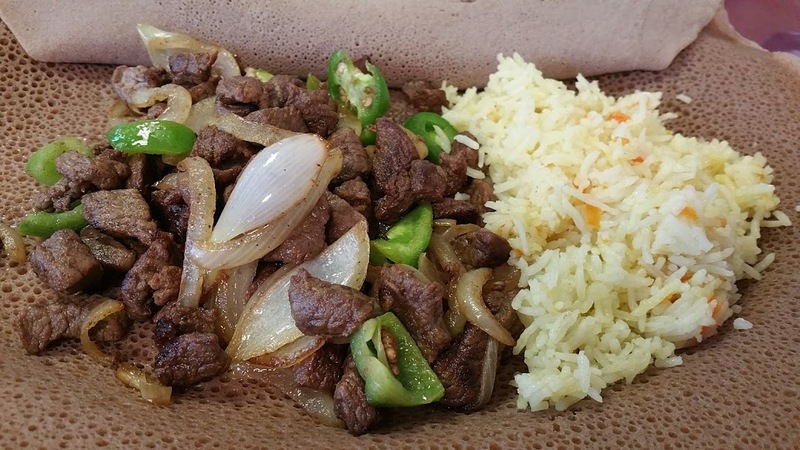 Zili Zili tibs, strips of beef sautéed, seasoned with Ethiopian butter, onion, garlic and jalapeno, rice. This was most spicy from the peppers, beef tender. That rounds out our food choices. It certainly was a fun lunch especially for the newbies. I am always happy when people break out of their comfort zone and try a new dish. The servings are quite generous, so there were several to go boxes. 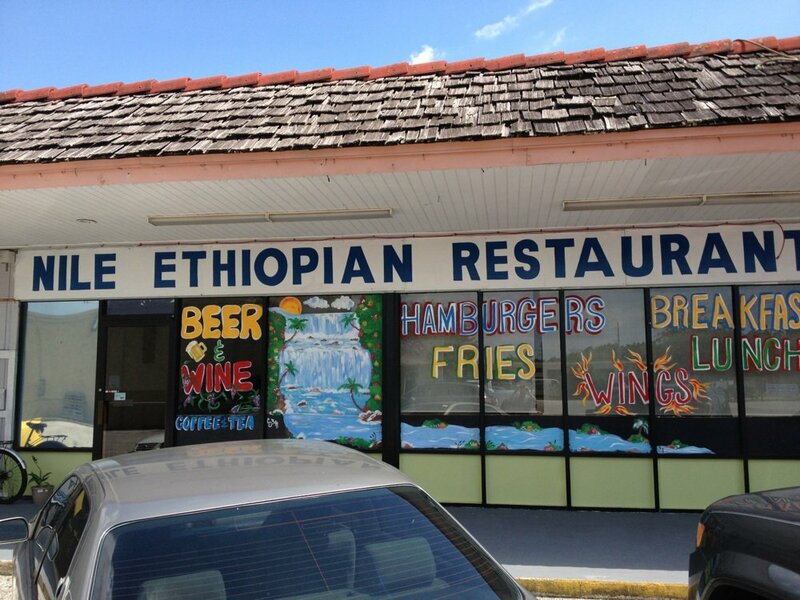 I highly recommend this spot, it has out lasted several other Ethiopian restaurants in town, plus it is a family spot that makes it even more appealing, to those of us who support the community and small local business. Something worth mentioning, if you ask, the staff will perform a wondrous Coffey Ceremony, it is a ritualized form of making and drinking coffee. The coffee ceremony is one of the most recognizable parts of Ethiopian culture. When we made our first visit, the staff treated us to the ceremony, everyone felt honored. Please take the time to experience this. I have read very favorable reviews about Ibex, will give it a try. Thanks for the feedback and reading the blog.